Ebi-kun had been working with the trinominal cube this week, he hasn't shown much interest in it for quite a while so I was surprised that he took it out. I gave him the presentation again then left him to it. I was busy cutting out and I could hear him talking to himself, he was rather amusing. "I love doing this, this is fun" and a bit later "this is stupid, I am not doing this again" but he wouldn't give up and later still "I did it! I can do it, it isn't so difficult really". He didn't know I could hear him so he came over to give me a hug and tell me he had finished. If you want to know what the trinominal cube is all about, there is a lecture here, the video quality is pretty poor though. I taught Montessori preschool for 12 years and now I am teaching college students for the past 5 years. 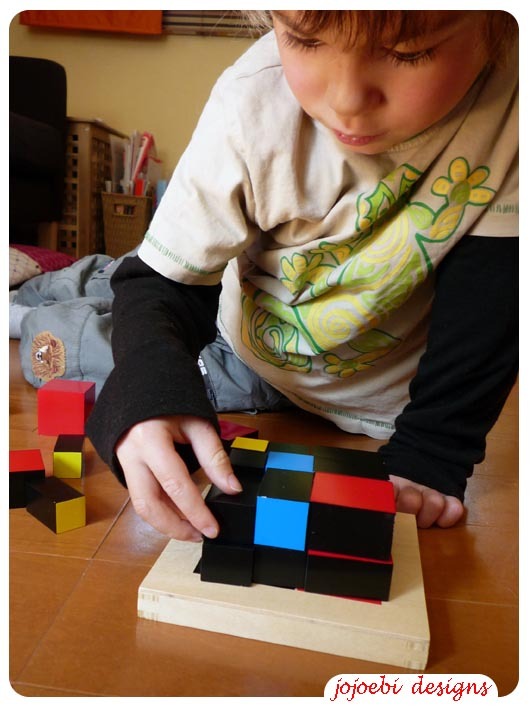 When I saw the picture of your son with the trinominal cube it brought back many many memories of the children in my classes plus my own two Montessori children. Good for Ebi Kun for sticking to it! I said the same thing when I first worked with the binomial cube. LOL. Jo, I just found your blog and I LOOOOVE it! So many ideas, such good works...Oh you are an inspiration to those who, like me, are starting on the decorative arts area. Thank you. I wil follow. That is advanced stuff! When you say you gave him a presentation, does that mean you basically explained the entire cubing process like in the lecture? Whew! No, just showed him how to rebuild the cube, that is about my level lol. And, because I am short of time and have been catching up backwards - from the latest post, let me add here that I hope the little one is all right now. Mine had a cultural show saturday too, with a little cough which I had to start drugs for, and I had to go to school to help make some stage props which would have taken one third the time and effort had they just communicated better... Isn't life much the same everywhere? Swati, hope your little one is better soon, sick kids is awful isn't it? Thanks, your wishes did the trick I think!